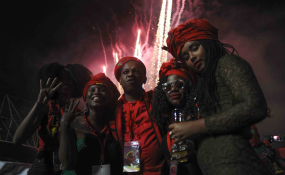 Cape Town — A community meeting in Atteridgeville, Tshwane saw Economic Freedom Fighters (EFF) deputy president Floyd Shivambu promise the community that t-shirts and food were just the beginning of what the EFF would offer once in power, TimesLive reports. "When we take over government, all we are going to do is to bring electricity, bring water, proper sewage system so that you live in decent settlements. We will make sure that in all townships we have got factories, manufacturing and industries that employ our people," Shivambu said. Shivambu added that landless people should claim unoccupied land, saying: "We say to our people we cannot wait for so long. If there is a land that is unoccupied, you must occupy it and use it for whatever purpose you want to use it for. You cannot stay in congested places like pilchards." Support grants are also a focal point, with Shivambu saying that once in government the party would raise the child grant to R900 while the Older Person's Grant would be increased from R1,700 to R3,400. The EFF will launch its election manifesto at the Giant Stadium in Soshanguve at 10am on 2 February.